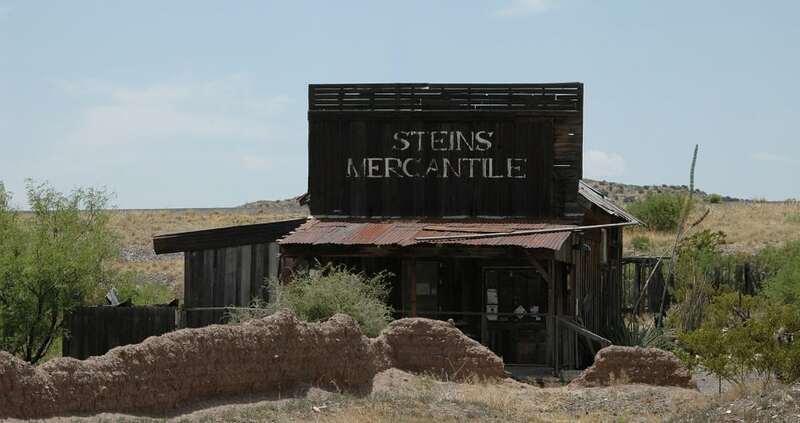 Originally a small stop on the Birch Stage Line in 1857, the town was named after United States Army Major Enoch Steen (sometimes spelled “Steins”), who was killed by members of an Apache tribe in 1873. The town flourished when mineral deposits such as gold, silver, and copper were discovered in the nearby mountains. Later the Southern Pacific Railroad established a rail line and a local quarry was opened. Steins had no natural source of water, so all water had to be brought in by train. In 1944, the railway ceased operation at Steins quarry and gave notice it would no longer subsidize water deliveries. The railway offered the residents free transport for themselves and anything they could carry, most of the population accepted the offer, leaving their houses and many of their possessions behind.